I am thrilled to invite you and any of your friends who might enjoy a ‘one-night only’ social, fun night of community singing with ARIA award winning vocal group THE IDEA OF NORTH. Idea of North invites you to join them for a good old-fashioned singalong within the safety of numbers. 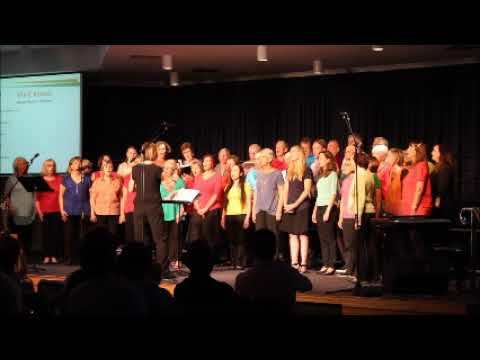 Immerse yourself in the buzz of singing in harmony with like-minded souls. All music will be taught by ear on the night - no music theory skills required. Learn excerpts from The Idea of North’s arrangements, and put yourself forward for solo spots if you’re feeling brave! Indian Blue is a member of Sweet Adelines International, a singing organization made up of 25,000 women worldwide, committed to advancing the musical art form of barbershop harmony through education and performance. We present for your delight and puzzlement, Men of the West. Led by director Ryan Morrison, these men have been refining their subtle theatre of pointless grandeur over the past decade, being regulars at the Fairbridge Festival and the Dunsborough Songfest. And picked up a Highly Commended Award at the Adelaide Fringe in 2014. Asylum Seeker Support Fundraiser Concert - a reflection on the loss of life among displaced people in our world as they seek asylum. Fundraising Concert in Support of Asylum Seekers. Profits to MercyCare and the Humanitarian Group (formerly Case for Refugees). Join us at the Fly by Night for a joyous, uplifting, thought-provoking and inspiring evening of song, story, poetry and drama. Perth’s own national quartet champions TLA will be at the Fly By Night Musicians Club on 3 May prior to heading to Las Vegas to represent Australia on the international contest stage. This will be the quartet’s first big show since they came together in early 2013 and they are looking forward to debuting a set of all new repertoire on the night. Since the 15th century, the vaulted arches of the chapel at King's College Cambridge, have helped to shape the distinctively pure tone of this special choir.